This math game makes playing with numbers a fun family activity. Their game night equation was simple: whimsical whale - math intimidation = fun! The computational companion to Scrabble, this math game makes playing with numbers a prime pursuit. Portable in its adorable whale-shaped pouch, it's an approachable, interactive game for all ages and abilities. Mobi makes a great gift for teachers, little ones, and family game collections. Designed by Vanessa and Mark Ellingson; Made in China. Vanessa and Mark Ellingson had an unusual design goal: to make numbers dance. 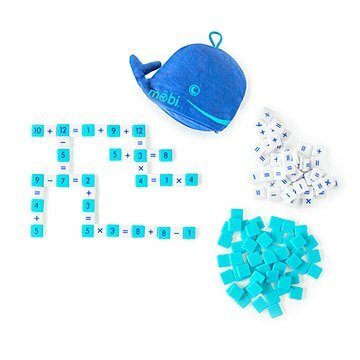 They created their Möbi math game to reflect shared passions and values of having fun, finding joy, and connecting to people while unplugging from things. They created a game that would help people of all ages and walks of life get comfortable with numbers. Most of the time, we play together, much like Scrabble. Sometimes, my 8-year-old niece (the receiver of this gift) plays by herself and combines all the pieces together. The best part is that every time, all the tiles can be used and that there are enough tiles with - and +, as the numbers are only up to 12 and thus one does not do a lot of multiplying and dividing. It's a fun and creative way to practice math. My niece loves it! I think my Grandson will have lots of fun and also be able to learn along the way while playing this game.